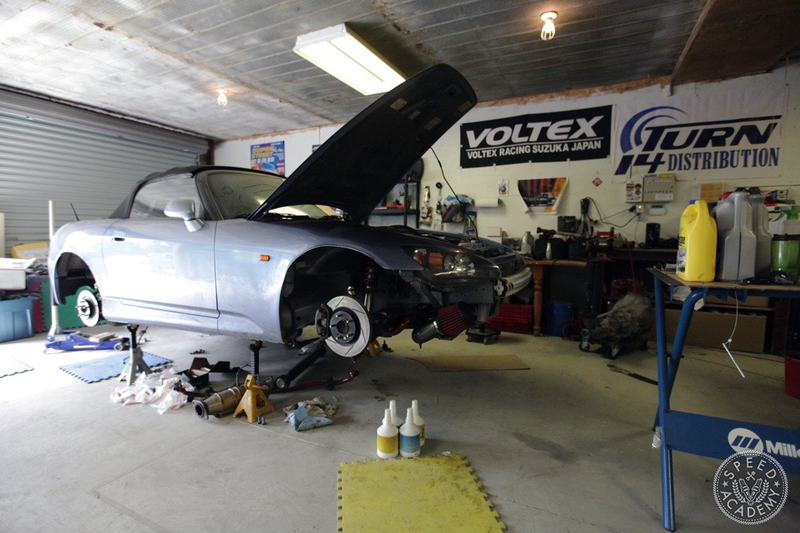 Our massive overhaul of what once was the worst AP1 in the world continues, and since we were waiting on some OEM nuts and bolts from Honda before we could finish up the suspension refresh, we decided to focus on installing a few key bolt-ons from Turn14 Distribution. 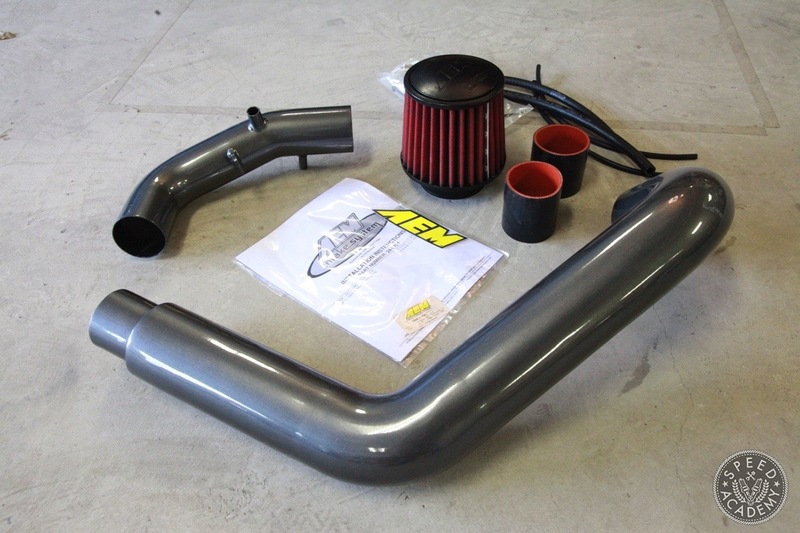 As we showed you briefly in the last update, Turn14 hooked us up with Mishimoto‘s direct bolt-on oil cooler kit and performance aluminum radiator and rad hose kit, plus with the engine rehung in the bay we could also install an AEM dual chamber intake system. 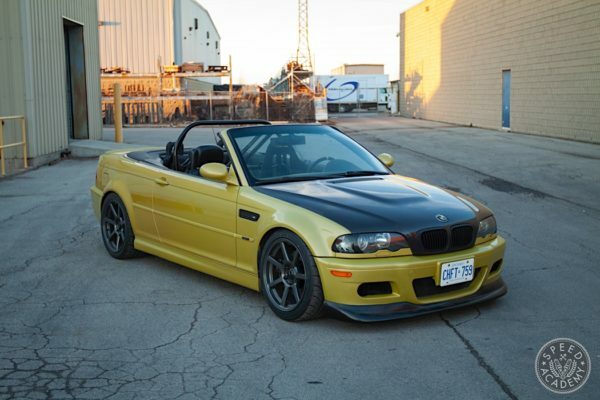 We started by installing the Mishimoto bolt-on oil cooler kit, since we had great access to the front end of the car without the radiator, intake system or bumper cover in the way. 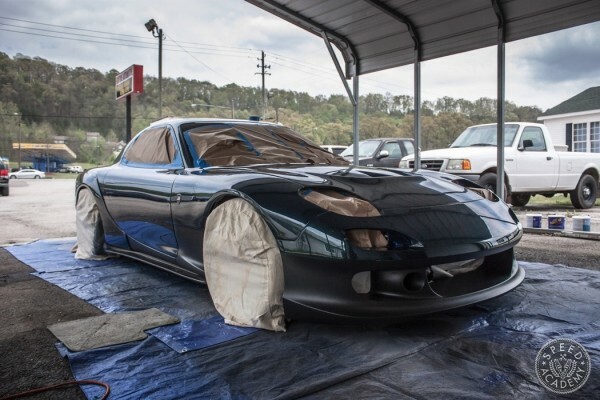 It was interesting to learn that Mishimoto doesn’t include a printed installation guide, but instead has a detailed video on their website that walks you through the process step by step. As a visual learner, this suited me perfectly. 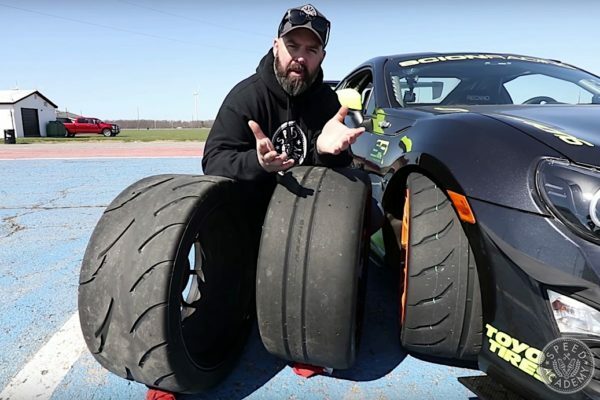 Check out their install video above to see what I mean. I think it’s a pretty brilliant approach to an installation “manual”. 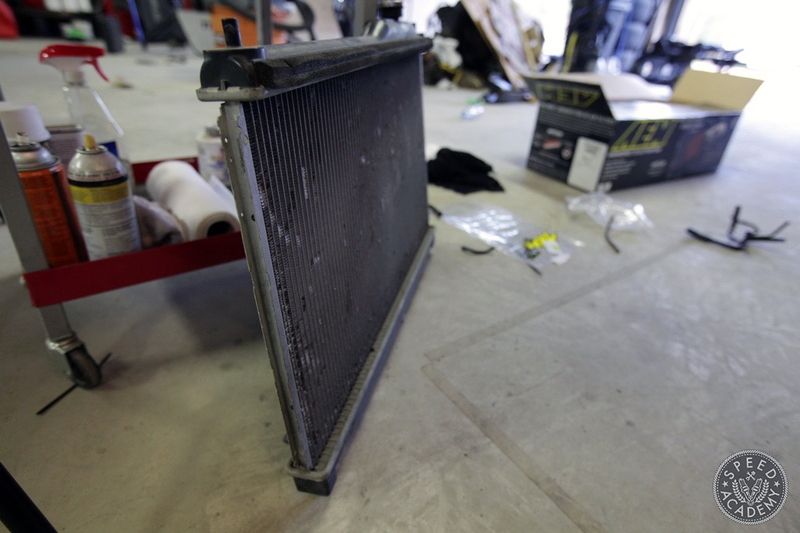 As you can see, this 19-row cooler kit is designed to be totally non-destructive, meaning it just bolts up without having to cut or drill anything on the chassis. 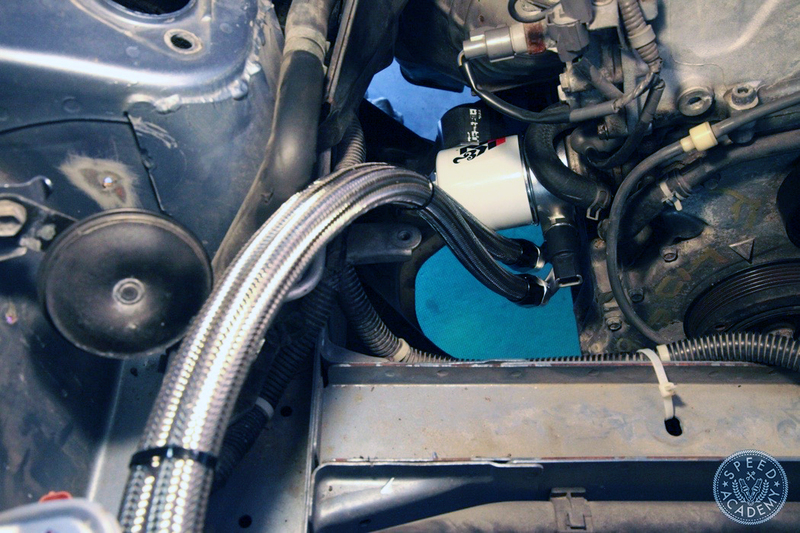 The brackets supplied for mounting the cooler worked exactly as explained in the video, so within a matter of minutes the cooler was hanging in its new home on our crapcan S2000. 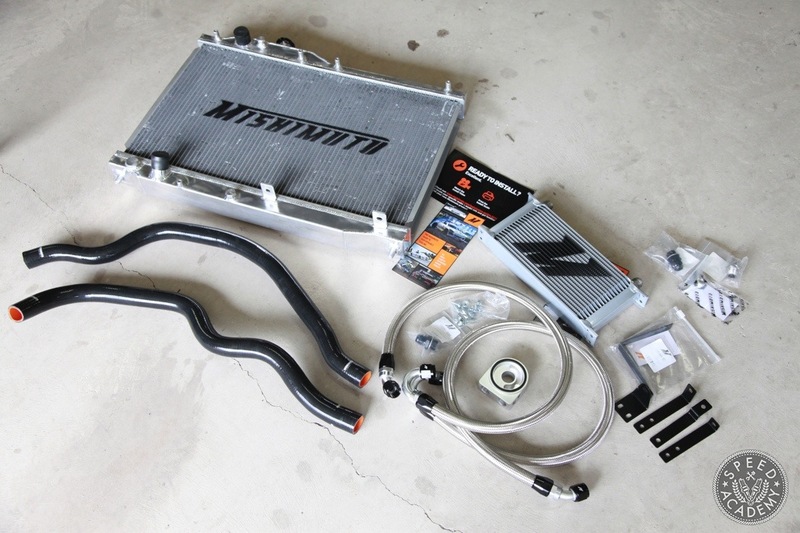 And having suffered the finger tip torture of assembling my own stainless steel braided oil cooler lines in the past, the fact that Mishimoto supplies fully assembled lines is a huge bonus in my eyes. 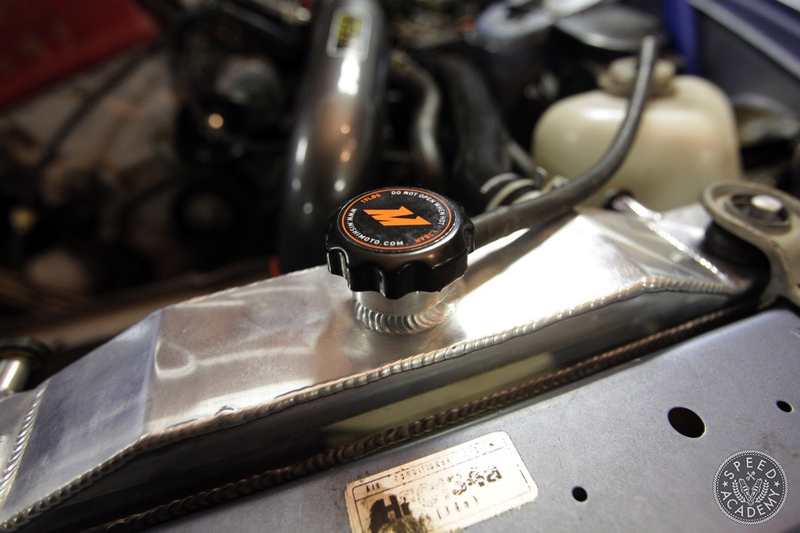 You’ll also notice that the sandwich plate has provisions for two sensors, and since we’ve got Auto Meter oil temp and oil pressure gauges going into the car soon, we went ahead and installed the sending units on the sandwich plate while we had easy access to it. Then I came down with my 93rd flu of the year, which meant I was laying on the sofa watching Netflex for a few days while Peter and his fully functional immune system tackled the radiator and intake installations. 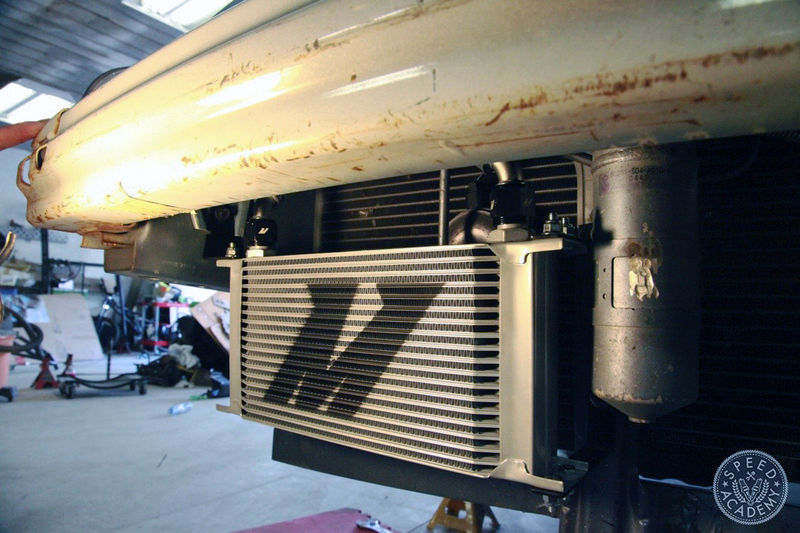 As you can see, the Mishimoto performance radiator for the S2000 is a serious upgrade over the OE unit, featuring a lightweight dual core and polished aluminum end tanks. The black plastic end tanks on the OE rad above are far more susceptible to cracks and leaks, something I’ve experienced first-hand on my EG Civic while driving home from the track and suddenly found myself at the side of the road calling CAA for a tow. A small off-track excursion cracked the lower end tank and I didn’t notice it until it was too late. End result? 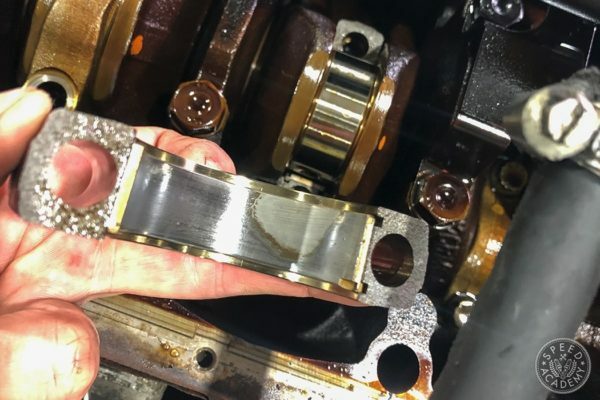 A severely overheated D16 with a warped head. Lucky for me that engine was cheap and easy to replace, but we definitely don’t want to be cooking our much pricier F20C. 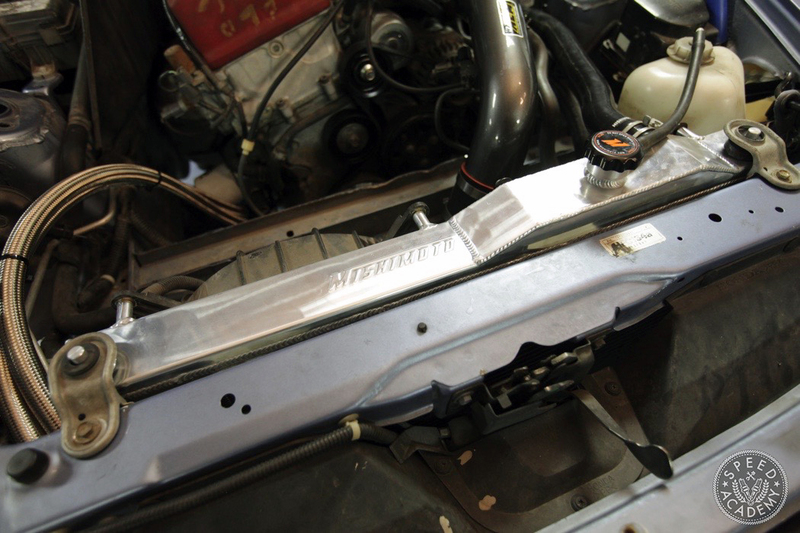 Just like all of Mishimoto’s performance aluminum radiators, this one is a direct fit design, so I didn’t have to feel too guilty about Peter doing the job solo. 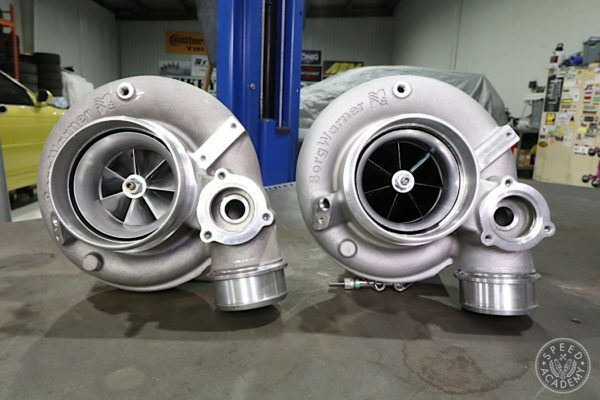 It literally just drops in place once you bolt on the OE fans. The rad also comes with a high pressure 1.3 Bar rad cap along with a lifetime warranty, and as you can see the weld quality is top notch. 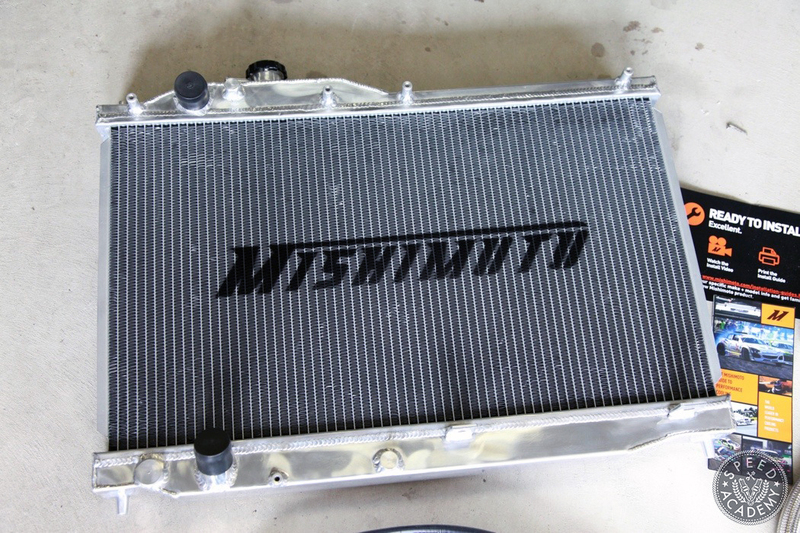 Mishimoto Coolers + AEM Dual Chamber Intake"
CDerian I’m not following here, where should we have used a gasket?